This podiatrist-recommended system is a soothing treat for your feet. Foot care can be a daily challenge, but this podiatrist-recommended system makes it easy to maintain healthy tootsies while you shower. The wide, gentle inner bristles massage your tender soles, while the stiffer outer bristles smooth rough skin and calluses, all while stimulating circulation. Shaped to cradle the foot, the contoured bristles offer an invigorating massage and extra cleaning power for the bottoms and sides of your feet (including the often-neglected areas between the toes), without having to bend over. Made in the USA. I did like that it came with a bottle of minty foit liquid, however the suction cups don't all stick. I was very pleased by the results. Good find! I really like the Foot Mate. My feet are clean after a long day running around after kids as a PE teacher. It is easy and convenient to use. Highly recommend this to clean your feet. The foot massage system was a real hit. Easy to use and feels great. I would definitely recommend this product. So clever! We all have feet...this item treats them well. I bought this as a gift for Mother's Day! It was delivered quickly, I am sure my mom will love it! I picked this up on impulse to help me and my husband care for our feet. The first time we used it, it tickled, but we quickly adjusted. 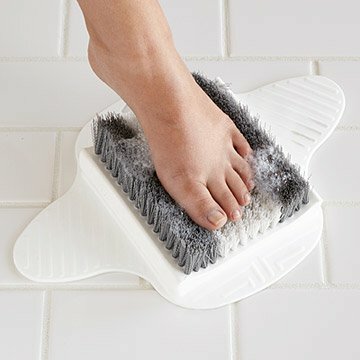 The floor of our shower is non-slip, so the suction cups don't work, but I just stand on one of the flaps while I rub the other foot on the bristles. The suction cups work fine on the side of the shower, so that is how we store it. After only a week we both noticed an improvement in the condition of our feet. Our callouses are much reduced and our feet feel better. Easy to use and a nice treat for the feet.